Jorges Louis Borges, argued in his essay, The Tradition of Kafka -Yes, you did click the right link. C’mon, bear with me here. The way to describe this, in brief, is that you can use a piece of media to look back at previous media and perhaps see ways that other seemingly unrelated things come together to forma sort of historical precedent for the new piece of media. This can be illuminating, where you show that even new-seeming ideas are precedented and connected and isn’t it beautiful to see the interconnections of our human ideologies, or you can be like me, a tiresome prick who constantly deflates people trying to act like Dark Souls invented the idea of plot holes, but, like, good. This all represents a toolset, a thing you can do to look at media. We sometimes use the term lens when we want to talk about media like this. Just like all these other ideas, they’re not all meant to overlap or be applied at the same time. What then, of Abe’s Oddysee, a game about farting and whistling? To talk about that, we’re going to need to talk about Meatpunk. Meatpunk is an artistic movement first codified in January, 2018 by Heather Robertson, aka Heather Flowers on Twitter. Yes, this year [Ed: See, this article was started a while ago]. That’s one of the fun things about Media Studies – you get to talk about new things, and see how those things connect to old things rather than be stuck trying to explain how one German mustache-lover gives us all the philosophical grounding we need to have no fun with superheroes, ever. Now these are just quotes from the manifesto and perhaps need a little elaborating, like the point of meat. So let’s go through these points. Anyway, the Zerg are an alien race of munching machines that use meat for everything they do, and they roll into a place and have a big ole war where they eat everything. Zerg stories as presented, though, aren’t meatpunk stories, because the zerg are colonisers and aggressors. The Zerg are rolling into spaces and taking them over, and the consequences of loss for Zerg are largely being sent away, not the loss of individual life. In the swarm, there is no meaningful individuality, there is no person to die, so there is no real survival. Meatpunk stories have a very specific, clear point of view. They are stories about survival in hard circumstances. To have a clear perspective like this in a manifesto means that it’s very easy to find things that aren’t meatpunk and discard them easily – Tyranids aren’t meatpunk, and neither is the organic-driven suburban society of the Flinstones. Yet at the same time, Voltron: Galaxy Defenders isn’t Meatpunk, because even though it’s about surviving in adversity and the interaction of bodies and technology, it’s much more of a story about technological spiritualism. Hey, remember those Zerg? They’re an enemy force in an army game where the forces opposing them include human colonisers meant to invoke both the Australian convicts and American Confederacy, and that invasion by the Zerg is used as a rationale to justify things like establishing a colonial Empire. This is part of what I’ve described before, about the Fascist Power Fantasy – where a story presents you with such an overwhelming problem that the only reasonable response for our culture is to retaliate by opting for Actual, Literal, Fascism. You know, Starship Troopers style. And Warhammer 40k style. And Ender’s Game, and – it’s a popular story type. Meatpunk stories don’t want to spend their time dealing with subtlety. They’re not for that. They want to make it very, very clear where they stand. If you want an example of a reason why you might want this, you could look at Man of Steel – which is a blatant Christofascist Objectivist Fascist Power Fantasy made out of Superman, a character created by a pair of Jews, including an immigrant and the son of immigrants. There’s a fuss going on about nerds surprised to see that in Star Wars, the Empire are meant to represent Nazis – and that’s Star Wars, not exactly the subtlest story around. If stuff that seems that obvious is being obscured by other actors, Meatpunk suggests, throw subtlety to the wind and be as clear as you can. Another thing about this is that there’s this habit of giving stories to fascism. Lots of people now will criticise Batman – a character who’s really cool and enjoyable to watch – as a fascist, and in so doing, they cede a cultural space and an icon to fascism. Meatpunk isn’t having that. Meatpunk stories are about forging positive experiences with bodies. That doesn’t mean the bodies have to be good or perfect or great – meatpunk isn’t about everyone having an idealised body, or even coming to see their bodies and damaged as somehow perfect or superior. This is also important because bodies are kind of how we do things. Lots of cyberpunk makes actions and interactions invisible – characters hacking may look like they’re standing apart from something. Stories that care about your relationship to your body necessarily care about your body’s relationship to the world. A meatpunk utopia has wheelchair access. Again, you can read the whole manifesto yourself, and this point is pretty deliberately ambiguous. Meat is weird, organic material is weird, and I feel that this point is mostly about dispensation. It’s about making it clear that there’s a lot of things meatpunk can mean, and that, excepting the other points, meatpunk is very inclusive of things that relate to meat. Mecha made of meat are meatpunk. Are Bosch-style landscapes of places that are also organic things and giant machines meatpunk? Are the Evas of Evangelion meatpunk? What about chemical transubstantiation or stories about eating the flesh of Jesus to keep him dead? Meatpunk has a lot of room for a lot of things. This one’s pretty self-explanatory, too. Meatpunk stories want to include things like guns made of ham, maybe it’s for the best you be willing to laugh along the way. We’ve seen in the past few years, the powerful way that ‘counter culture,’ the ‘punk’ of cyberpunk, becomes just the everyday and loses its aspect of rebellion. It’s how one of the most well-known modern cyberpunk videogames is about playing a cop who cops cops. Meatpunk wants to keep that edgy, raw, awkward imperfection that drives punk rock. In a way, this is also a drive to repeat the prior points: Don’t be subtle, don’t let fascists feel comfortable. I want you to know I haven’t contacted Flowers about this piece at the time of this first draft writing, in part because I want to make my interpretation of the movement without just parroting her – because hey, she wrote the manifesto, if I can’t get it out of that, then the manifesto’s not doing its job. 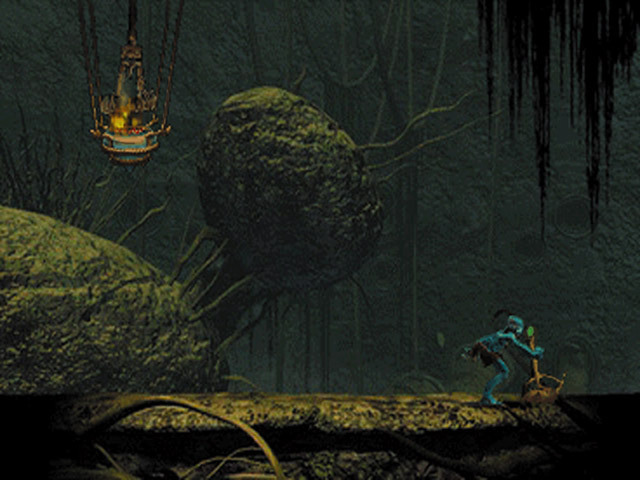 In 1997, 21 years before Heather wrote the Meatpunk Manifesto, and one year after Heather was born, GT Interactive published a videogame called Abe’s Oddysee, by Oddworld Inhabitants. Abe’s Oddysee came out in 1997 and it looked like it. I’m not going to make you watch that, and instead all this footage is collected from The Oddworld New’n’Tasty re-vamped version that was released 4 years ago. Don’t worry, though, the core of the game is the same, it’s just one of them handles recording software better and has a resolution larger than you’d expect for a forum avatar these days. Anyway, Abe’s Oddysee is a step-platformer puzzle game with some stealth sections, some running sections, some timing and jumping puzzles and the whole thing is set in the perilously weird world of Oddworld. 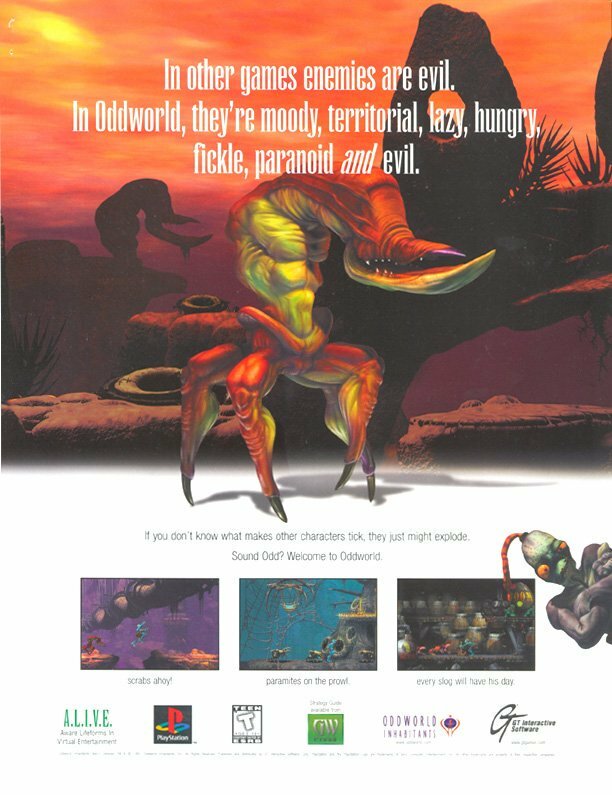 As seems to be a trend for my writing, Oddworld was a world all about slightly crap aliens. You play Abe, a lowly space janitor – wait that’s a trend too, weird – who discovers one day at work that his bosses, the comically evil Glukkons, have decided to boost profits, they’re going to start turning their Mudokon workforce into their latest product, and sell them. 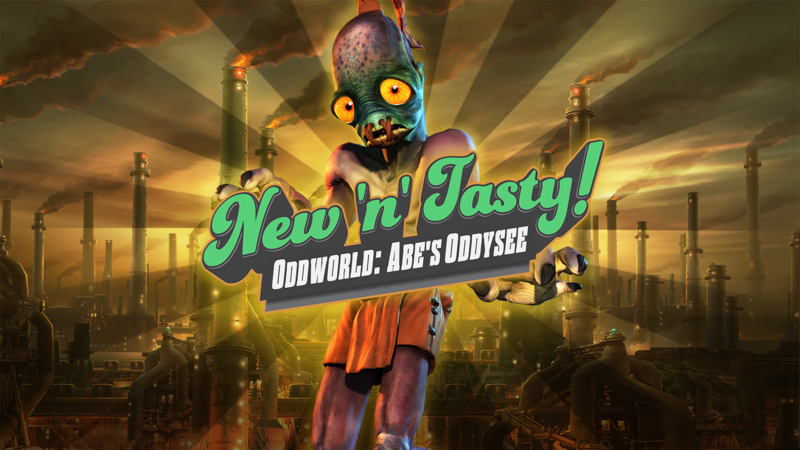 Abe isn’t keen on this and this game isn’t Oddworld: Abe Discovers His Vore Fetish and so, he bolts out of the plant, discovers his destiny, solves all the levels, passes all the trials, and comes back to the factory to rescue all the people you were surrounded by at the start of the game. Except it’s not as simple as tagging them and moving on, you have to lead these rescuable Mudokons to portals, and you often need to do that by moving them, making them stop, coordinating them to act as one at the same time, or make them interact with big sequences of events and it’s great, because this means the game has to have a communication system in it. Rather than give you context menus or anything like that, though, instead, Abe’s Oddysee gives you its much-vaunted communication system where you press a button, and Abe will deliver that button’s communication. These communications are pretty simple – you know, hi, come here, follow me, fart and a series of coded whistles. What you get is a classic hero’s journey stories that also incorporates a lot of chanting, whistling and farting, and sometimes you slap someone to keep them from hurting themselves, but then you have to fart to make them happy again, because the Mudokon are a simple people. Oddworld was hyped before its release as a sort of revolutionary kind of game, where the inhabitants of the worlds would have a sort of super-AI, a realism above and beyond what we were appreciating in other videogames of 1997. This was, as with many such things, pretty much just hype – in Doom we’d seen monsters that could fight each other, and before that, in the Ultima Underworld games there were enemies that could align against one another. There was talk about how you could communicate with the characters of this world, how you could comfort them and play with them and convince them to work with you, and if you think this is sounding a little bit Molyneux, yes, it’s true. Molyneux wasn’t involved, but his spirit was loud and proud in this game, which was otherwise a really competent, really fun step platformer with a bunch of cool mechanical ideas going on, an inventive and creative world, and just the most wildly overpromised conception of AI. What’s really funny is, if you look at Oddworld as a game, it’s not the kind of game you want to have emergent AI or confusing, potentially messy situations. It’s a step platformer, something in the same vein as Prince of Persia or Flashback, just made with a lot more personality and bigger, more expressive sprites. It isn’t what Jesper Juuls calls a game of emergence – you can look at the game as a sequence of rooms, and you can see every room as a solvable puzzle. If you can’t come up with a way to solve a given room, you can come back to solve it later, after finding something in another space. It’s kind of funny, in hindsight. It wasn’t like you could advertise a game easily back then saying ‘we’re making a game like Flashback’ in the era of Quake Consumes The Gaming Landscape. And Oddworld was definitely a game more about its world and its style and its aesthetic than it is about its mechanics, even though the game that you get for your money is a really good little game! Why’d they talk about it like it was the second coming? Alright, so we started with Kafka, went to Itch and then back to the 1990s and advertising campaigns. What exactly is the purpose here? I want to forward to you that Abe’s Oddysee is a Meatpunk text, and until Meatpunk existed, it wasn’t, but once Meatpunk did, it always was. Honestly, there are a lot of things you can call Abe’s Oddysee, as a genre, but there’s no single clean, solid genre grouping that it stands out in. It has the Crap Aliens of comedic works like Tom Hall and Douglas Adams, but it has a bleak grungey aesthetic that is focused not on human interface with aliens, but rather with the everyday and most mundane lives of those living in these spaces. There’s no human observer, in-universe, to look at the lives and labour of the people of Oddworld, so the only perspectives within this universe are of Oddworlders on other Oddworlders. There’s no cyber, though there’s cyborgs, there’s no steam, though there are steam vents, and despite being alien, it’s not about aliens. It could be called science fiction but only in the most basic sense in that there’s science and it’s fiction, and with its powerful mysticism and its vision of an organically interconnected life, it’s a little short on the futurism that science fiction tends to feed on. What do we get if we look at Meatpunk as our lens to look at Abe’s Oddysee? Well, let’s run down the checklist. Is Abe’s Oddysee about Survival in hard circumstances? You’re trying to escape the Rupture Farms, then you’re trying to get rid of the Rupture Farms to give your homeland a way to heal. There’s a prophecy, but the power of the Shrykull when it’s given to you is still only empowered by saving people, and the moment you’re given this power, the game reminds you that you’re a dork. Is it openly political in a way that makes fascists look bad? It’s more of a critique of capitalism and labour exploitation but I think you’ll find there’s a lot of folk who believe capitalists and fascists aren’t dissimilar. Is there a relationship between bodies and the world? Despite the huge automation in these plants, the Mudokon are still used as slave labour to do even mundane things like scrubbing floors. You trip, you fall, you hit walls, Abe’s face marks him as a slave, and most of the puzzles are about getting your body into a space where it can do something. This isn’t a game about what power you can project beyond your body. Even the most remote skill you have, the Possession is about command of a body. Does it care about making rent? Does it do its research? That’s a moving target, really. You can make a case about the research this game did into its representation of non-specific oppressed indigenous people, but that’s some lore stuff. Maybe once upon a time, there was a vision to get rich making Oddworld games, but these days, it’s definitely an indie affair. About the only thing missing from this lineup is that Abe’s Oddysee isn’t particularly punk rock. This is an aesthetic decision as much as anything else, but while you can point out the piercings and shaves and living outside of the shadow of the man, Abe’s Oddysee does hold itself back from the most basic of Punk Rockness in its lovely soundtrack. One of the like, deliberate but not stated things that the Meatpunk Manifesto does is it kind of requires you to write about people who aren’t the privileged class of the setting, because if your struggles can go away when you accept your privileges, you’re not really struggling for survival. Meatpunk needs you to be someone who has some skin in the game. What does this mean, then? If Meatpunk is a 2018 idea, how does a 1997 game fit in that genre? What I’m suggesting is that Abe’s Oddysee is an antecedent of Meatpunk. That now we have the idea of Meatpunk, we finally have a term to describe what Abe’s Oddysee always was, even if it wasn’t that until we had the idea of Meatpunk itself. This matters is because it shows that the tradition of meatpunk, of this idea, while it is new and exciting, it is not unmoored from history. If you create Meatpunk, you’re creating something that is both new and something old. You are connecting together a history of principles and ideals and forging them onwards in new, exciting directions. Welcome to now, you’ve always belonged. You can get Oddworld: Abe’s Oddysee on Steam and GoG.